This is part of my latest portfolio. I am concerned with the layers of London, and using layers of images, primary source from snapshots, drawn by hand, and using digitised processes, I am interested in the 'less visible' against certain 'backdrops' like a 'backstory' of what you think someone is about, or just someone coming from somewhere, and feeling ties with the area, on an everyday basis. So 'noticing' things was a way to 'slow down' the world, to where you could decipher it for yourself. It is in that sense that I take quick snapshots of my surroundings, when I am in a hurry and want to capture something, such as at Notting Hill Carnival. ​​I love the Notting Hill Carnival, and raucous riot of colour and revelry. It really transforms the streets of London in a colourful and celebratory way, and as it first begun as a way to quell disturbing racial violence and share mores and customs between mainly two related but different cultures, so it has a serious underbelly. I have chosen two images from there. In this composition, I loved the fact there was a team involved in beautifying the Carnival Queen, particularly as a Black female, as even today, there is a disparaging view of Black female beauty, in some circles. I was particularly chuffed when I got a pose underneath, as it was coming to the end of the day. There are a couple more in the series, but I had to be disciplined haha. ​Included here are a couple of works that I capture in what I term my 'Snapshotist' mode. It is a creative process, as you are using your aesthetic sensibilities, but I wouldn't describe it as true photography, as it's less involved. ​​At first, or rather during my second phase of going, as a teen, I really didn't appreciate the essence of the costumes, and the culture behind that side of it, but just wanted to hear a particular 'Sound' or see a group, but the Maas bands and the orchestration that goes behind it, really is at the heart of it, and is something to behold. This is part of my latest portfolio. 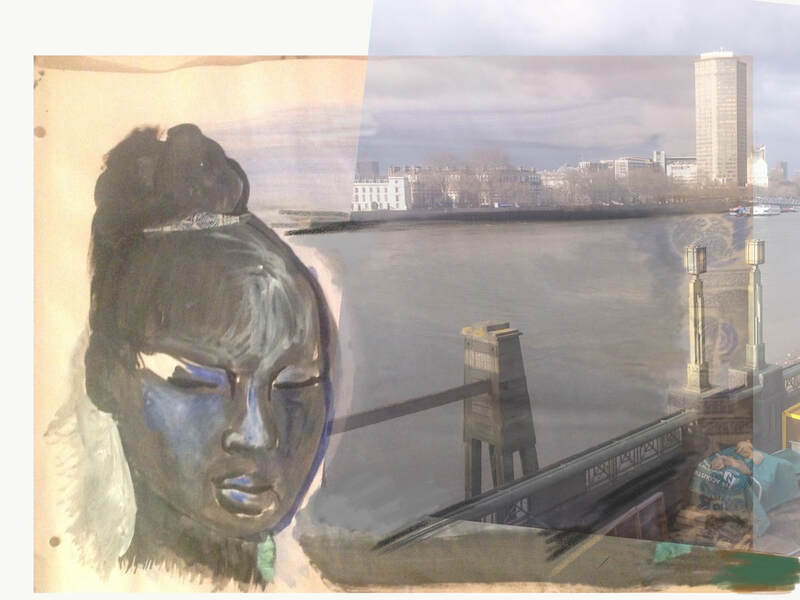 I am concerned with the layers of London, and using layers of images, primary source from snapshots, drawn by hand, and using digitised processes, I am interested in the 'less visible.' well in this instance and in other instances, it is about 'Visible Minorities'. I was thinking about the incidents of attacks against females who wear scarves, and who are or appear to be Muslim. ​I like the similarities and contrasts between the carnival images and this nightclub image. below. London is famous for it's diverse clubbing scene, and you can find somewhere to go every night of the week. The sense of playfulness in the image below, with the spotlights, I think they both show and the sense of female freedom, which one hundred years after some women got the vote, we should be grateful for. Having said, some would question how 'free' this woman is, and would see it as degrading, but I don't se it in that way, as we must remember that we don't all have the same wishes and desires or likes, or boundaries. Using digitalised means, combined with drawing has evolved due to the need to have a flexible lifestyle, but it chimes with London, and the splintered way in which information, visual or otherwise, is digested. This is part of my latest portfolio. 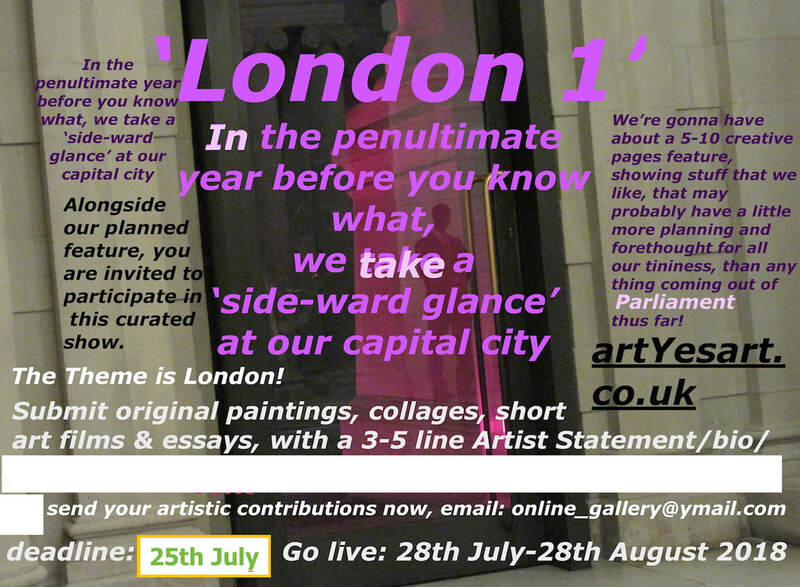 I am concerned with the layers of London, and using layers of images, primary source from snapshots, drawn by hand, and using digitised processes, I am interested in the 'less visible.' as a qualified Teacher, I have worked with many young people and try and assist them to maximise their resources and opportunities. This image is in progress, and is about the docks, in general really, wherever you find them. I'm using what was more local to symbolise further along the river, but ended up working close to where part of the narrative of displacement echoes loudest, so will revisit there. The fun and enjoyment of clubbing and going to Carnival, provide a welcome relief from the 'heavier' sub-texts of uncertainty and seriousness that is enveloping the country, and the city to maybe a lesser extent. But you have the macro and you have the micro, and although London is the capital city of a major industrialised country, it is still a place of dreams, of simple wishes, of home. Say something nice to Abena about her work. Or engage politely.